The Spell of Italy is a bracing, invigorating, fast-paced study of the image of Italy in German culture from the eighteenth century to the twentieth century. Wearied by his life as an administrator at the Duke’s court in Weimar, in 1786 Johann Wolfgang von Goethe departed unannounced in the middle of the night for what had been the destination of his imagination since childhood: Italy. His extended stay there dramatically affected his views of art, architecture, prose, poetry, and science. When he returned to Germany and Weimar, Goethe’s experiences translated into his life and work in ways that influenced countless others as they developed Germany’s own brand of high culture. 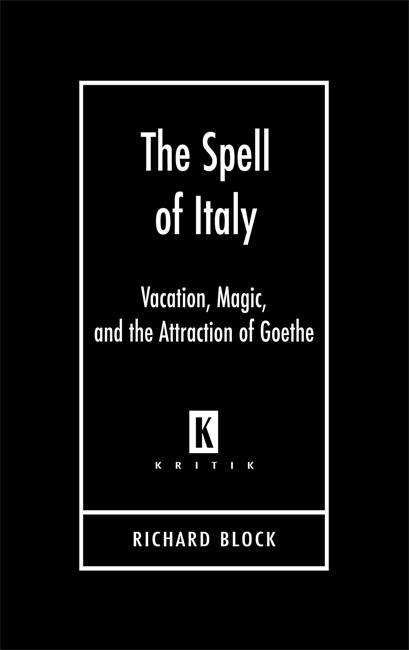 The Spell of Italy: Vacation, Magic, and the Attraction of Goethe tracks the peculiar space Italy occupies in the cultural consciousness of German writers by reconsidering the Italian journeys of Goethe and Winckelmann and the legacy of those journeys in the works of Heine, Nietzsche, Freud, Mann, Carossa, and Bachmann. Author Richard Block contests previous assumptions about Italy as a place to encounter classical culture and creative rebirth. His study examines the degree to which Germany’s literary and cultural traditions appropriated a phantasmic Italy, showing how Winckelmann’s art history and Goethe’s Italian journey predisposed later writers to search for an aesthetic ideal in Italy that did not exist, and how their search for this absent ideal eventually resulted in disillusionment and deception. Building on previous work on Goethe, literary theory, and cultural history, The Spell of Italy offers compelling new ways of understanding Germany’s fascination with Italy from the eighteenth century to its troubled political history of the twentieth century. Richard Block is assistant professor of Germanics at the University of Washington. He is co-editor of The Spirit of Poesy: Essays on Jewish and German Literature and Thought in Honor of Géza von Molnár (Northwestern University Press, 2000) and translator of Peter Bürger’s The Thinking of the Master:. Bataille between Hegel and Surrealism (Northwestern University Press, 2002). While Block's argument is associative and repetitive, the books power lies in its formidable ability to address the vicissitudes of tradition from a variety of vantage points." The Spell of Italy is a bracing, invigorating, fast-paced study of the image of Italy in German culture from the eighteenth century to the twentieth century." I believe that Block has made a valuable scholarly contribution to a truly fascinating subject in German cultural history."